US President Donald Trump said it was unfair of House Democrats to grill his former attorney and fixer, Michael Cohen, while he was conducting high-wire negotiations on the other side of the globe. "Having a fake hearing like that, and having it in the middle of this very important summit, is really a terrible thing," Mr Trump said of the explosive session on Wednesday before the House Oversight Committee. "They could have made it two days later or next week." He raised his eyebrows and pursed his lips as a reporter read out - Mr Cohen's descriptions of the president as a "con man" and a "racist". Mr Trump proceeded to accuse his former devotee of lying - a charge that the witness also levelled against the president. Mr Cohen, who has admitted to lying previously to Congress, faces a three-year prison sentence scheduled to begin in May. 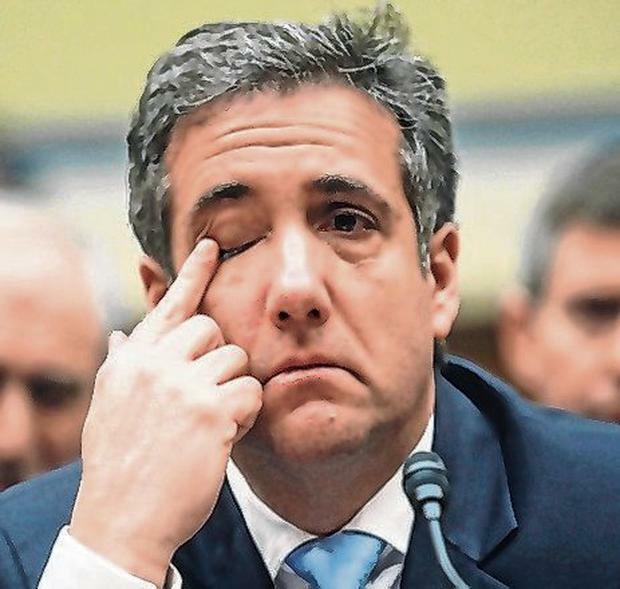 Mr Trump said there was one point, however, on which Mr Cohen had spoken truthfully. He praised him for declining to claim that he had hard evidence of collusion between the Trump campaign and Russian officials. Mr Cohen did say, however, that he had "suspicions". "He lied a lot, but it was very interesting, because he didn't lie about one thing," Mr Trump said. "He said no collusion with the Russian hoax. And I said, 'I wonder why he didn't lie about that too like he did about everything else'." Mr Trump said he was "actually impressed" that his former clean-up man, whom he has maligned as a "rat" for co-operating with federal prosecutors, "didn't say, 'Well I think there was collusion for this reason or that.' He didn't say that." Mr Cohen addressed the question of collusion in his opening statement, and his point was not as exculpatory as Mr Trump made it out to be. "Questions have been raised about whether I know of direct evidence that Mr Trump or his campaign colluded with Russia," Mr Cohen said. "I do not. And I want to be clear, that I have my suspicions." One particular suspicion, he said, involved the possibility that Mr Trump had prior knowledge of a meeting in Trump Tower in June 2016. The tête-à-tête, details of which came to light the following summer, brought together Donald Trump Jr and a Kremlin-aligned attorney promising "dirt on Hillary Clinton". Mr Cohen recalled being with Mr Trump in early June 2016 when his son came into the room, walked behind his desk and told him in a low voice: "The meeting is all set." Because Mr Trump had little trust in his son's judgment, as the lapsed loyalist alleges, and because he liked to be clued in on all campaign-related activities, Mr Cohen concluded that the younger Trump was referring to the Trump Tower meeting, he said. He also claimed that Mr Trump knew ahead of time that WikiLeaks was planning in July 2016 to release a cache of emails damaging to Hillary Clinton. Mr Cohen told lawmakers, in a previously undisclosed allegation, that he had been in Mr Trump's office when the then-candidate received a phone call from Roger Stone, a longtime associate, who told him that Julian Assange, the founder of the anti-secrecy organisation, was preparing a "massive dump". The claim contradicts denials of advance knowledge of the purloined emails by both Mr Trump and Mr Stone, who was charged in January in the inquiry led by special counsel Robert Mueller. Still, Mr Trump took heart that Mr Cohen had not gone further in suggesting links between his presidential campaign and with Russia, which the president maintains are non-existent. "I was, you know, a little impressed by that frankly," Mr Trump said. "He could have gone all out. He only went about 95pc instead of 100pc. But the fact is there is no collusion. And I call it the witch hunt. This should never happen to another president. This is so bad for our country." Mr Trump was able to tune in on some of the fireworks, he said from Hanoi.